Smoke stacks release exhaust that comes from various industrial processes within a factory or another type of facility. Smoke stacks mostly release carbon dioxide and water vapor into the air, with some nitrogen and oxygen mixed in as well. Air pollution is harmful mostly in high densities. 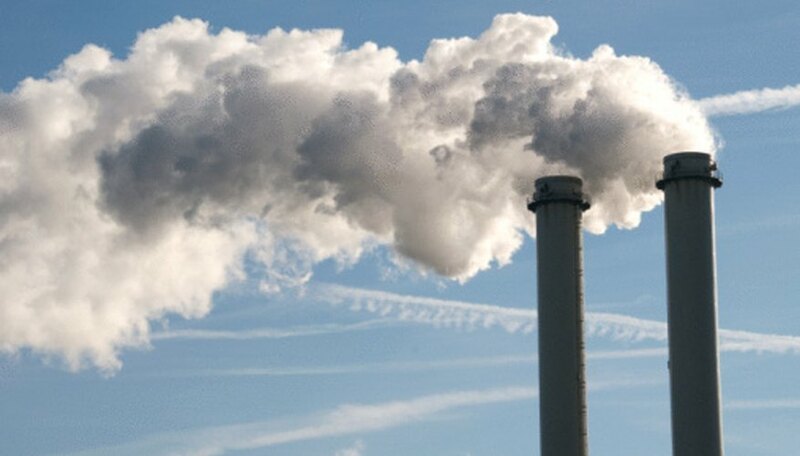 Every year, smoke stacks release 7 billion metric tons of pollution into the atmosphere, according to the Smithsonian National Museum of Natural History. Tall smoke stacks emit the pollution from the inversion aloft, creating a fanning plume. This plume does not pollute the nearby area. Otherwise, the smoke stack forms a fumigating plume that can cause health problems to those in the nearby area. There are also other plumes sometimes created by the smoke stack. Depending on how the power plant releases the exhaust into the air and how outside forces impact the exhaust, the smoke stack can develop a coning plume, a fanning plume, a looping plume, a lofting plume or a fumigation. Children going to schools near buildings with smoke stacks releasing large quantities of pollution have developed ailments such as asthma and cancer. According to USA Today, one in six schools were within a half-mile of an industrial plant. Without smoke stacks, these plants would release copious amounts of toxic air on to the schools. Given their height, smoke stacks must be lit so that planes will see them. Since the exhaust can cover the lights, the lights must be five to ten feet below the top of the smoke stack. Owners can also floodlight the smoke stacks with fixed searchlight projectors. Carbon filters contain pores through which only small particles can pass. Smoke stacks are retrofitted with carbon filters to reduce the exhaust released into the atmosphere by the smoke stacks. These filters must be covered with fire-resistant coating so that they do not burn up when the hot exhaust passes through them. Oftentimes, technicians attach carbon fiber sheets to concrete substrate with the wet-layup process. Effective fitting can also prevent cracking in the smoke stacks. The exhausts released into the atmosphere can create acid rain, which can cause injury and damage to nature and property. The acid rain comes from smoke stacks that release sulfur dioxide and nitrogen oxides. Manufacturers and power plants often try to use coal that contains less sulfur dioxide. The facilities also use scrubbers to clean out the smoke stacks and reduce the amount of harmful emissions. Pearson, Charles. "What Are Smoke Stacks?" Sciencing, https://sciencing.com/info-8068108-smoke-stacks.html. 09 January 2018.